Raja Rozmin is a registered teacher with the Royal Academy of Dance. A former practicing lawyer and natural dancer, Rozmin left the legal world after seven years to pursue her love for dance full time. She cultivated her passion for dance at Dancesteps Studio where she started training in Hip-Hop, and then Advanced 1 Ballet level and the Advanced 2 Modern Theatre. 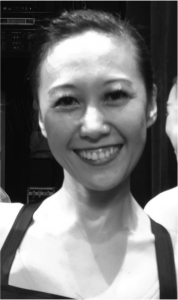 Rozmin is an established instructor, and her vibrancy and enthusiasm in teaching is evident in all her classes ranging from Modern Theatre, Jazz and Classical Ballet. Rozmin performed at the Short & Sweet Festival 2009, her first foray into the world of stage shows. She has also collaborated with veteran dancer Ann Tan for the same festival, in which her entry entered the finals. She is currently active in preparing students for competitions and in 2017, her entry in the ISTD Modern Theatre awards picked up the silver medal in the Premier Category.